THE FRENCH GOVERNMENT recently introduced a law that makes it illegal for supermarkets to destroy edible food. Under the new legislation, supermarkets will have to prevent food waste and will be forced to donate unsold edible food to charity, or for use as animal feed or compost. Now a Fine Gael Councillor wants Ireland to follow suit. 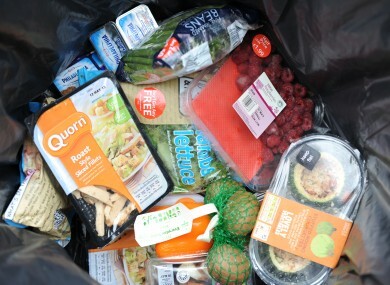 Neale Richmond, a member of Dún Laoghaire Rathdown County Council, has called on Agriculture Minister Simon Coveney to introduce a new law that will make it illegal for supermarkets to destroy edible food in an effort to cut waste and encourage increased charitable donations. “At the end of the day many supermarkets throw away perfectly good food that could be better used,” Richmond said. The councillor noted that organisations like Foodcloud in Dublin and the Bia Food Initiative in Cork are engaging with businesses to get them to donate their excess food to charities working with those in need. Ireland is the fifth worst country in Europe for wasting food. Richmond said introducing the new law would “compel many supermarkets to cut down on the wastage of perfectly good food and also increase the donations to these excellent social enterprises”. The US state of Massachusetts introduced a similar law in 2014, banning businesses from throwing out food if they throw out more than a tonne of it every week. “Starting with supermarkets, there is no reason why this law could be progressively applied to restaurants, hotels and catering companies. “There are initiatives in place already but enshrining it in law I feel is a common sense move that will go some way to helping those in need and I have been in touch with the Minister’s office to see if he can push this forward,” Richmond said. The Department of Agriculture did not reply to a request for comment, but Minister Simon Coveney responded to Richmond’s Facebook post on the issue, saying it was an “interesting idea”. Do you think this type of ban is a good idea? Email “Should we ban supermarkets from destroying edible food?”. Feedback on “Should we ban supermarkets from destroying edible food?”.